It’s currently estimated that there are about 3,000,000 millionaires in the United States today. And given that there are about 300,000,000 Americans according to the latest Census data, that means about 1 in 100 are millionaires. Even more startling is that means that you probably know someone who is a millionaire, and you probably live within a stone’s throw of other millionaires that you don’t know. The truth is that a lot of millionaires have very specific habits. Traits that make them successful. One of the most interesting aspects of my Better Know a Young Millionaire Investor series is what makes some of these millionaires tick. Beyond the inspirational, here are five fundamental habits that your millionaire neighbor has but probably isn’t telling you. Many millionaires start young. It’s so much easier to start young rather than older. You just have more time – it’s simple math. He got into a lot of hot water for this quote – but think about it. If you start at 25, you have 10 more years than starting at 35. You can debate the rate of return all you want, but younger is always better than older. However, part two is to not mess up. This means avoiding student loan debt, credit card debt, and not getting into financial trouble. Some of the most common causes of debt and financial trouble include: increased expenses with reduced income, unemployment, gambling, poor money management, no money communication skills, and banking on a windfall. If you stick to a balanced budget and start early, you’re already on par with your millionaire neighbor. Remember, focus on front loading your financial life. There’s messing up, and then there are avoiding big expenses that could possibly be avoided. Two of the biggest life expenses are moving and divorce. First, moving may be necessary, and it doesn’t have to be expensive. However, for many people, it is. Just the cost of paying movers can add up into the $1,000s of dollars, so the more you do it, the costlier it is. Second, if you have to sell a home, the transaction costs are enormous. The more you do it, the more profits you eat into. Now, moving can be a good thing – getting a better, higher paying job. Or maybe you’re moving closer to work to minimize expenses. You can even use inexpensive movers to mitigate costs if you’re moving farther away. Just remember, constant moving is a constant budget buster. Next, we have to address divorce. Divorce is one of the leading wealth destroyers in America. Now, can it be avoided? Not always. But there are genuine things that you can do to minimize the likelihood of it and the financial costs that come with it. First is communication. Communication about money is essential, as finances are the leading cause of divorce. And divorce never stems from lack of money – it comes from failure to work together with money. You need to put systems in place that allow you to work as a team with the money you have to better your future. Common goals and common understanding are key. There are much better resources than this when it comes to money and family, but realize that divorce destroys wealth. That’s why your millionaire neighbor has probably been married for years. Beyond just starting young, you should also invest slowly over time. I’m not saying that you have to dollar cost average when you invest, but you should start investing early, and continue to invest throughout your life. This is the power of compound interest. The later you start, as mentioned in #1, the more you have to invest to get the same return. Your millionaire neighbor probably started investing in their 401k at their first job and just continued to contribute to it at every job. He or she also probably maxed out the IRA contribution each year. These simple investing steps over time allow you to build real wealth. For most Americans, their wealth is in the homes, which they paid off over time, or in their retirement accounts, which they built up slowly over time. So, if you want to join your millionaire neighbor, start investing now, and continue to do so regularly. Your millionaire neighbor also probably didn’t do it just working their job. Maybe if they are over 65, but even then, there was likely more to it that working the nine to five. Most millionaires had a side hustle or combined income streams. It’s very rare for a single income family to make it to millionaire status. If they are a couple and both worked, that is probable. If they didn’t have kids, it is even more likely. But the better way to make it to a million is to not only work a salaried job, but also to side hustle or have some type of entrepreneurial project. By developing multiple income streams, not only do you create a safety net for yourself as you work towards you goals, but you also can reap the benefit of multiple income streams, especially if some are more passive than others. If want some passive income ideas, here’s a list of 20 different passive income streams. 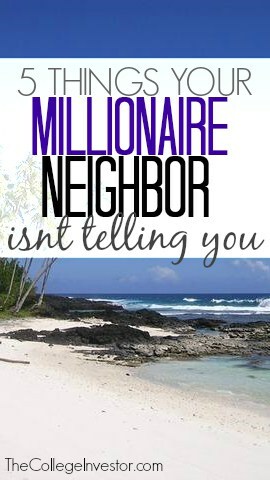 Your millionaire neighbor may have a secret business besides the nine to five – just look at most bloggers out there! Finally, most millionaires live well below their means – so much so that you may not even believe that they are millionaires. I know a large handful of millionaires that are beyond frugal – driving the same car since the 1980s, shopping at thrift stores, never eating out. I even know young millionaires that look for frugal deals online, and use coupons to pay for everything online and offline. Check out this post on how to save $500 per month by using simple tricks. But it makes sense – many millionaires didn’t get rich by spending their money. They got rich by saving their money and making smart money decisions. And those are habits they developed over a long period of time, so they don’t change even when there is plenty of money to spend. 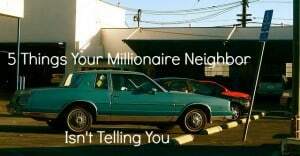 So, if you want to match your millionaire neighbor, mimic them and don’t let them even know you have money. Live frugally, make smart money choices, and live below your means. You’ll get the joy of being a millionaire without the hassles of maintaining an exuberant lifestyle. 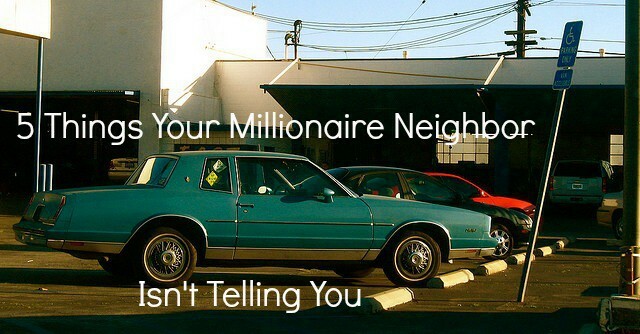 What other secrets to success do you think your millionaire neighbor has? Good post Robert! I think many of these are key, especially starting early and living below one’s means. I would also add, for some, that it meant pursuing their goal with no abandon. Whether that be running their own business and making it their life’s goal to save/invest as much as possible. The thing about many of them is they do not necessarily live like they could be. Take Buffett for example, he’s been living in the same house for years here in Omaha. He could live wherever he wants, yet he stays where he is and saves a chunk of money doing so. That’s a great story about Warren Buffett. I think he drove the same car for 20 years as well! Great list. I like #1 the best, but it’s also the most difficult. Most 25 year olds just aren’t in the right mindset. I think part of the problem is lack of financial education. We have to take all kinds of ridiculous electives in college; why not have a finance literacy class? I have never heard of such a thing. Very few schools have them, but I’ve heard of a few financial basics classes at high schools and colleges. But you’re right, a big part of the problem is knowledge about the basics. I’m actually concept testing a business that would bring financial education to collegiate-organizations: sports teams, educational groups, social organizations. I’m having trouble validating that the grown-ups would spend money to provide this education. Any and all thoughts are welcome! Got to say I agree with all of these. The Millionaire Next Door really highlighted what the real millionaires in the US are like. They aren’t the crazy rich people that are throwing money around. It’s the normal family that started a small business and have lived in the same house for 30+ years. That’s a lot of millionaires in America! It’s all about stealth wealth baby. Be rich, but act poor. Let nobody know what your true wealth is. How many people can get 12% every year for 40 years? If you can do that, you’d be a billionaire. I’m pretty sure in 30 years we’ll have a ton more millionaires. Like they say – a million isn’t worth a million anymore. I agree with you on that, but maybe the next mark is $5 or $10 million. Regardless, don’t you think the same principles apply? Great points. I think the recent downturn probably delayed the path to becoming a millionaire for many, I know it set my timeline a few years back, but now that things are back on track, I’m using a lot of these strategies and you can see that it’s setting the table for greater success. One thing to point out is that these things may yield frustratingly slow results at first, but the momentum will build and build. I don’t think being a millionaire will mean much in 20-30 years. Soon, we’ll redefine millionaires as people making over $1 million a year, which is far more impressive and brings back the exclusivity. I do think that saving $100/month is very reasonable for most 25 year olds. Not everyone will be able to do it, but if you take it out before you start thinking about what you can afford, it’s very doable. Most people I know can certainly save that much (and definitely waste far more money than that per month), but some have other priorities because they know when they earn more money, they’ll be able to save much more to make up for it. Yes, earning $1,000,000 per year is extremely impressive. That would be over $83,000 per month, which is a large sum of money for anyone to earn. That’s an exclusive club! All millionaires have goals and plans and they are working them all the time. They always have their money working for them. I find it ironic that one of the leading causes of divorce is financial stress, while one of the leading causes of financial stress is divorce. It seems a little like circular reasoning to me. My mom used to work at a bank, and she would tell me stories about how some people looked like the biggest hick farmers you have ever seen, but they had some of the largest bank accounts. The secretly rich are all around them, and hopefully one day I will join their ranks. Robert, I am so in touch with this topic and the tweet is right on target. I just wish folks would act. It is not difficult to become a millionaire….. if you start young and follow your suggestions!!! And let’s face it, weddings are a huge expense, too! I have recently married friends who will be paying off their weddings for years. Creating multiple income streams is my favorite one out of the 5! Especially with how big of a pool of money is in the online world now through various affiliate methods, once you figure out the formula, you can easily create more and more streams of money. Web consulting, website creation, affiliate marketing, website flipping, amazon (branding your own product), etc. There are so many different income streams to look into. This makes so much sense. A lot of people should be aware of this. They need to know that no one achieve their goals just by sitting around or scratching lottery cards. Something needs to be done and it all starts somewhere. You need to decide that you need to start now. $100/month is really doable. Such great tips! #5 is certainly my favorite. Even when I was making next to nothing my first year in New York City, I continued to live below my means. It’s amazing to me how many people try to give off the appearance of affluence and it sends them to the poor house. Wouldn’t you rather be satisfied knowing what’s in the bank then pretending you can afford the latest and greatest car, gadget and appliance?! Could be just me, but I’d rather be able to retire early and live comfortably than be living large in my 20s and 30s. Nice points there Robert. It almost seems startling to read the fact that 1 person out of every 100 is a millionaire. Seems like it isn’t that difficult to be a millionaire if one sticks to some ground rules and keeps investing a decent sum over a period of time. I can see why Dave Ramsey got into heat over that comment. $100 a month for a lot of people my age is incredibly insulting! Most of them are working minimum wage, comparable or commission-based. They have student loans, they have credit card debt and commitments to tech things like cell phone bills and wireless connections. I’m not excusing my age group but, would like to illustrate that they were thrust into a lot of these situations before they knew any better, usually while in high school – hardly an age to make major financial decisions. Onto the millionaire side. It sounds like the majority I read about lived below their means before achieving that status. It also sounds like almost all of them receive multiple streams of income. In fact, I remember reading that is a major difference between them and the general public. They may still work for a living but, they make their money work for them. Most people save their money or spend it. Few put it into stocks, start a company, produce a product, sell a skill, etc. Really well written article! #2 really hit home for me. I’m not married, and hope when I am to never get divorced. My parents went through that 12 years ago and the financial burden is still eating away at my father, I hear about it on a weekly basis. What I can really speak to is moving expenses related to new jobs. Depending how far of a move you’re making, and to what city, it can EASILY hit $10,000 dollars all things considered. You should really evaluate the necessity of the move. Make sure it’s a worthwhile endeavor and your new employer provides you with at a minimum, a relocation bonus to cover the moving expenses. It goes without saying, but evaluate cost of living in a new city, potential for growth within the company and how it will look on your resume. Simple and to the point. Thanks for these great tips, these are things that I will keep in mind when setting my goals in the future. I just did a back of a napkin calculation… A lot of people like to drive a nice car and are content to pay, say, $400 per month to lease a higher end one. Many people lease for purely cash flow reasons and this gives them the opportunity to drive a decent car every 3 or so years with a minimal up front financial commitment. So if a person leased a car for say a 30 year working career at $400 per month or roughly $5000 per year. Taking a reasonably conservative investment return of 6%, that $5000 per year over 30 years would end up generating $395K! Of course, one could argue that one has to drive something. So if you lived below your means, saved your money and paid cash for a $20K car and drove it for 15 years, and only bought 2 cars in that 30 year period just think how much extra cash you would have if you didn’t care about what people thought about what kind of car you drive. My only point is, one needs to think seriously about what they NEED vs what they actually WANT. I know many people who make a lot of money but spend more than they make because they have some sort of imaginary standard they need to live up to. Yet, they have nothing to show for their many years of earning big money. By the way, if you changed the 6% average return to 10%, the number goes up to $822K. Something to think about. Those are really true. Time is really you’re greatest friend when it comes to achieving your dream of becoming rich. I hope every people in the world will know those and start saving there hard-earned money today instead of spending it on useless things. If you do all of these, with persistence, over years, it is a sure fire path to a million plus. This article is spot on in all respects! These should be called the 5 commandments of personal finance! I’m doing most things right, it appears 🙂 hard work is where it’s at. I think many people have the idea that a millionaire throws their money around and buys everything that they need. The reality, as you point out, is that if they did this they would not be millionaires for long. The great thing is, that we can all start getting in to these habits now and that will set us up to be millionaires in the future! No wonder Ramsey got into hot water by posting that – so many people thing that you need to be extremely skilled or talented in order to be able to save a lot of money and what not. That is not true – common sense and discipline is all that is generally needed! This is all great advice~ I definitely wish that I would’ve started sooner…but there’s nothing I can do about that! “Live below your means” is quite possibly the best financial advice on earth, I think. My parents did just that and are relatively wealthy even though they had fairly low-paying jobs when I was growing up. Don’t move and don’t get divorced are two excellent tips. I’ve seen how both can really wreck one’s financial stability. I set goals to live below my means. It’s not always easy, but it’s the only way to go. So glad I started investing at 24. Even on an actress’ salary I can invest $1200 a year. Start young & live below your means are the keys that allow EVERYONE the option of becoming a millionaire. I would add that you must plan to become a millionaire from a young age. With that in mind, you will consider how every financial decision you make might affect that plan. You’ll still screw up plenty but over 40 yrs you can recover from lots of mistakes. Bonus: If you make your mistakes younger, they won’t cost as much! I started at age 20 and have followed those basic rules plus a few more for 20 years. The trick is to be consistent. Stay on the path when life tosses you a curve ball. Be true to your self and your goal. Recommit to your goal and the process a few times per day if need be. It is not for everyone because it requires hard work and you have to postpone gratification. It is a lifelong endeavor to achieve wealth. After you achieve it, it is another endeavor to keep it. However, it is doable if you want to be free. That’s awesome that you started so young – too few people do. The hard work has paid off. I am not FI in my eyes, but life is less stressful by having options based on my savings and investing. I am new to blogging and twitter. I have spent years reading the the FI and FIRE forums. It is a blast interacting with like-minded people. I started investing at 25 and I feel like I’m on a good track, but I definitely “messed up” young with student loan debt. Hard to get back on track after a set back like this, so I need to forward this to some younger people and tell the, not to make the same mistakes I did! Thanks for sharing! I keep trying to get the message out to high schools and young college students – don’t get buried in debt!